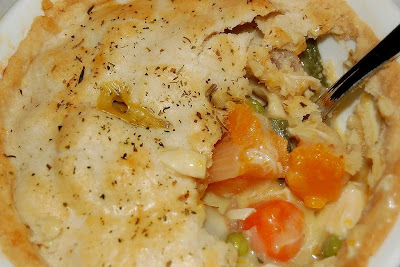 Chicken pot pie is a favorite at my house so I was excited about this weeks Barefoot Bloggers recipe, chosen by Deb from Kahakai Kitchen (she has a wonderful blog and is so nice, stop by!) I've actually made this recipe before, last fall, so this time I made a few changes. Most importantly, I reduced the fat in the recipe and used a combination of olive oil and butter. I also added cubed rotisserie chicken, since I knew it would go off much better with a little "substance". For vegetables, I would suggest using whatever you have on hand or is in season- the quality is usually much better and the price is, too. This time I added green beans, peas, and extra carrots to Ina's recipe (leaving out the fennel). For flavoring, I skipped the liqueur and used extra chicken stock and Herbes de Provence (I got mine at Safeway, but this one at Williams Sonoma is adorable!). The seasoning is wonderful and great on pastas, soups, and more- it's become a staple in my pantry. I skipped the heavy cream and added some milk since my sauce was thickening a lot and I had some extra vegetables. This is another winner from Ina- the filling is delicious (even with less butter!) and the pastry top has the perfect flavor and texture. If you're in a pinch for time, don't forget that you can make the pastry in the food processor and keep it in the fridge until you are ready to roll it out. You could also assemble the pies the night before and through them in the oven after work. Either way, it's delicious and worth the time to make these from scratch! Melt the butter in a large pot over medium heat and add the olive oil. Add the onions and saute until translucent, 10 to 15 minutes. Add the flour, reduce the heat to low, and cook for 3 more minutes, stirring occasionally. Slowly add the stock, milk, herb de provence, salt, and pepper, and bring to a boil. Simmer for 5 more minutes, stirring occasionally. Season to taste- the sauce should be highly seasoned. Cook the potatoes in boiling salted water for 10 minutes. Lift out with a sieve. Add the green beans, carrots, and squash to the pot and cook in the boiling water for 5 minutes. Drain well. Add the potatoes, mixed vegetables, onions, and parsley to the sauce and mix well. Divide the filling equally among 6 ovenproof bowls. Divide the dough into sixths and roll each piece into circle just larger than the tops of the bowls. Brush the outside edges of each bowl with the egg wash, then place the dough on top. Trim the circle to 1/2-inch larger than the top of the bowl. Crimp the dough to fold over the sides, pressing it to make it stick. Brush the dough with egg wash and make 3 slits in the top. Sprinkle with sea salt and cracked pepper. Place on a baking sheet and bake for 45 minutes, or until the top is golden brown and the filling is bubbling hot. Wow - lattice pastry. How gorgeous! Yours looks really good. You are so sweet! You made such a beautiful pie and I am sure the chicken was yummy in it. Great job and I am glad you liked the pick! I had to pass this week ... but am so glad I get to enjoy yours! It looks so delicious and love the lattice!! The lattice top is so pretty! Pretty lattice crust! Nice job! No fair that you had already made this! :) Yours just looks so delicious, really delicious. I would love a plate of it for lunch today! 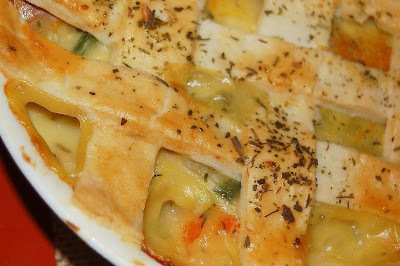 Your lattice pie crust is so pretty it makes me want to make this again and try harder on my own crust! (Mine was not pretty). But it was a delicious pie. I made some substitutions too. 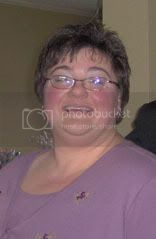 Anne, yours is beautiful! I wish that I had your butter adaptations ahead of time -- I tried to cut it down too, but I think I cut out too much, and didn't add some olive oil to make up for it. I'm bookmarking your version, because I did enjoy this recipe! I think I'll need to go on a little hunt for herbs de provence! Beautiful job, as always! Back again Anne, talking diapers this time, not pot pies. I saw your comment - yeah, we actually need to move up to 4s, but I'm squeezing her into 3s for another week or so while we finish up the package. What is it about jumping up to the next diaper size that makes me feel all weepy? I'm glad I'm not alone! They just grow up way too fast. Sigh. I love that you have made this before. I also did my own variations. Also, I just last week posted about puttting together my own herbes de Provance, from herbs in my garden. Even had enough to give to other foodie friends. I had these great little Indian spice contatiners that I got over there. Great variations! I wish I had cut back on the butter, but it sure tasted fantastic! Your lattice top is beautiful! I love your lattice top. I too, cut back on the butter. You did a wonderful job on this one. I love the lattice work! Oh, it looks wonderful! 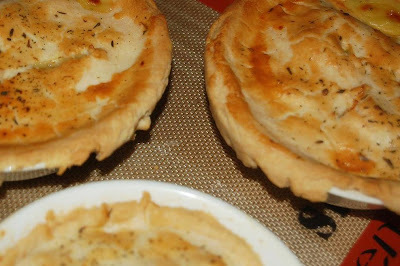 I make pot pies all the time... so I wasn't too stressed about it either. I wish I could create beautiful foods like you! I love the changes you made and the lattice pastry! I have to make this. Your pastry top is just too pretty! this looks wonderful. I still have to make mine! do you mind if I add you to my blog?